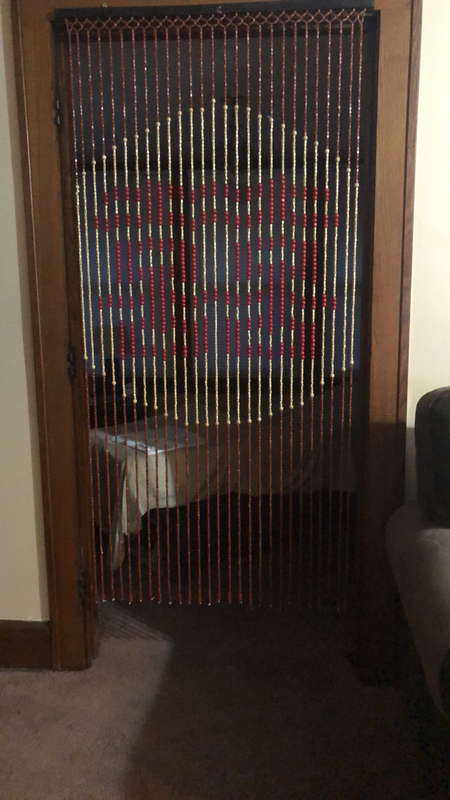 Wooden Bead Curtain - Harmony - 35.5" x 69" - 27 Strands of wooden beads. 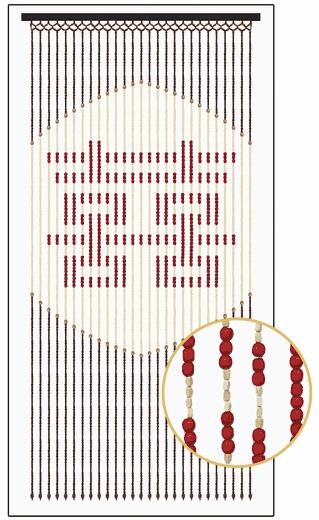 The design consists of irregular shaped squares in light beige and larger squares in cherry red surrounded by dark brown square beads. The header rail is black and has 2 eyelets attached for easy installation. The top 1.5" of the curtain has a decorative design. A brown wooden cylinder bead hangs from the end of each strand for a clean finished look. You definitely see the design better from further away but its pretty and different. this doorway was what I needed to go into my small home office. It is not a thick bamboo doorway. the beads are not close together. it gives a nice barrier without being difficult to walk in and out through. It would not be good for a bedroom because you can see through it. It was perfect for my need and it is very pretty.